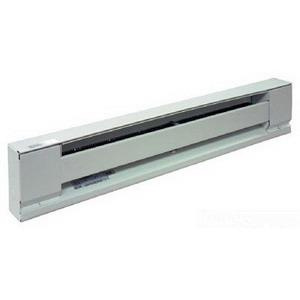 TPI 2900 Series Electric baseboard convection heater features stainless steel heating-element with aluminum fins. This 1-Phase heater has power rating of 1500-Watts. This white heater has 22-gauge steel housing with painted finish for longer endurance. This 20-gauge junction boxes located on each end of the heater includes quick-connect cable clamps and 6-Inch ground lead wires. It measures 72-Inch x 6-Inch x 2-1/2-Inch. It delivers output of 5100 BTU/hour. Wall mountable heater has current rating of 12.5-Amps and voltage rating of 120-Volts at 60-Hz. Electric baseboard convection heater is ETLus listed.